Visit this unique flower garden in Northern New Jersey in the Springtime to experience a "Rainbow on the Hill" as thousands of iris flowers are on colorful display. Irises are some of nature's most dramatic, colorful flowers. If you love irises and happen to find yourself in Northern New Jersey during the months of May or June, then you simply owe it to yourself to schedule a visit to the Presby Memorial Iris Gardens. Located in Montclair, New Jersey, in Essex County, the Presby Memorial Iris Gardens are home to more than 14,000 irises of some 3,000 varieties! In the blooming season the Gardens are a vibrant display of color and natural beauty that enchant visitors who come from all around the area—even the world—to appreciate this unique and historic collection. All photos on this page were taken by the author, sockii. 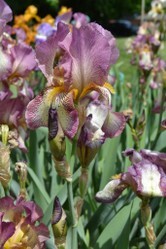 Please feel free to visit my full photogallery of the Presby Memorial Iris Gardens at Flickr. The Gardens were first established in 1927, as a tribute to noted Montclair citizen Frank H. Presby. Presby was one of the founding members of the American Iris Society. He was actively involved in iris hybridization and owned a fine collection of notable plants of his own. During his lifetime, he expressed a desire to gift some of his collection to the newly acquired Mountainside Park of Montclair, but unfortunately he passed away in 1924 before he could see his wishes come to fruition. 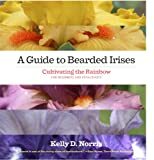 In 1927, Miss Katherine Inness (first curator of the Montclair Art Museum), presented to the local government the idea of establishing an iris garden in Presby's memory to help attract visitors to the area and further education about the care, history, and hybridization of the flower. Several local organizations along with the American Iris Society collaborated to see the plans for the Gardens come together, under the supervision of Mrs. Barbara Walther, chairperson of the local Citizens Committee. Walther—who with her husband owned the property bordering Mountanside Park—was a fixture at the Gardens and involved with their operations up until her death in 1977 at the age of 94. The Citizens Committee purchased the Walther home in 1977, and it then became their headquarters. The Gardens today see 10,000 visitors annually, there to learn about and enjoy the beauty of the iris collection. Work is continually ongoing to improve and maintain the gardens, and to keep the many plants healthy and blooming strong. The irises are planted in 26 beds each presenting a piece of unique iris history and development. Bed 5, for instance, features Heirloom Irises from the 1500s through to the early 1900s. Bed 9 presents the "History of Hybridizing", and others are dedicated to "Hall of Fame" irises of different decades in modern history. Every iris is identified with an easy-to-read marker showing the plant's name, who was the hybridizer, and the year the iris was registered with the American Iris Society. Thus a visit to the Gardens are a unique chance to learn about the history of the flower and how mankind has assisted in its evolution into such a variety of colors, sizes and flowering patterns today. You'll also find a collection of non-bearded Siberian, Japanese and Louisiana irises planted along the sides of a creek bed running through the Garden grounds. Adding to the natural beauty of the park is a collection of alternative and unusual trees and shrubs. These flowering, attractive landscape elements also help encourage natural pollination and thereby add to the health of the irises. Irises along the creek bed at Presby. The Presby Memorial Iris Gardens have also survived several unfortunate incidents in recent years, including an inexplicable act of vandalism which occred in 2005. One day in August of that year, gardeners arrived to find that two of the iris beds had been brutally attacked and 156 iris rhizomes were uprooted. Separated from their identifying markers, it took several years for some of the plants to be "nursed back to health" and bloom again so they could be identified and placed back in their appropriate beds. A dozen of the plants did not survive the attack, and the vandals were not identified until a year later, in 2006. It turned out to all be due to two drunken teenagers who decided to "practice their golf swings" by taking clubs to the flowers, according to the Montclair police. In 2008, someone attempted to steal some of the irises from the garden but they were eventually recovered. The Presby Memorial Iris Gardens are located at 474 Upper Mountain Avenue in Upper Montclair, New Jersey. The Gardens are open to the public dawn till dusk during the blooming season, and a suggested $8 donation helps fund their upkeep and operation. The peak blooming season is typically from mid-May until early June, and you can keep track of what's in bloom and the prime time to visit via the Garden's official blog or their Instagram. The official website for the Gardens also has an ongoing calendar of events including live music performances, plant sales, and educational programs to learn more about home gardening. The Gardens are located just off the Garden State Parkway if you're driving from either the north or the south, and street parking is available nearby (although most of the closest is time limited to two hours maximum.) New Jersey Transit's Montclair-Boonton train is an option to visit from New York City on weekdays, and Montclair is served by several bus lines as well. There is no food service offered on site, although on weekends and holidays you may find food trucks parked just outside the grounds for light refreshments. Downtown Montclair is nearby as well, and home to many great restaurants and fun shops to explore to make your visit complete. A day at Presby is an unfortabble experience for an iris lover! Have you ever been to the Presby Memorial Iris Gardens? Thanks for reading...your comments are welcome below! Irises make me think of painting, too. Georgia O'Keeffe, Van Gogh, and countless illustrations. I didn't know there were curly irises, by the way; those are striking too. And the one blue-tinged at the edges is incredible (as an option for irises). These irises are so beautiful! Great idea to have such a garden. The Brooklyn Botanic Garden is a wonderful place to visit in the springtime, when you can enjoy beautiful blooming flowers, check out the greenhouses, or simply wander about.